Butterflybush flower (Mimenghua)-Buddleja officinalis Maxim. Botanical Name: Buddleja officinalis Maxim. Common Name: Buddleja, Butterflybush flower. Part Used & Method for Pharmaceutical Preparations: The flower buds are gathered in spring and dried in the sun. Functions: 1. To clear heat in the liver; 2. To brighten the eyes and reduce corneal opacity. 1. Heat in the liver manifested as red, painful and swollen eyes, photophobia, excessive tearing and corneal opacity. Butterflybush flower (Mimenghua) is used with Chrysanthemum flower (Juhua), Sea-ear shell (Shijueming) and Tribulus fruit (Baijili). 2. Deficient yin in the liver with yang attacking upward manifested as dizziness, blurred vision, dry eyes and corneal opacity. 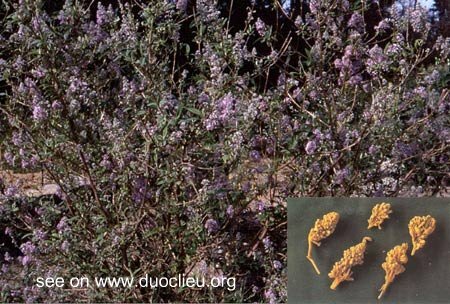 Butterflybush flower (Mimenghua) is used with Wolfberry fruit (Gouqizi) and Flattened milkvetch seed (Shayuanzi).